How much does it cost to make a tandem skydive? What kind of parachutes do you use? What about if I wear glasses or contacts? What if I am too old or in poor physical condition? What is the training for Tandem? Do I have to do a tandem skydive for my first jump? What if the parachute does not open? What type of person makes a tandem skydive? Tandem skydiving refers to a method of skydiving where a student skydiver is connected via a harness to the tandem instructor. The tandem instructor wears a larger than normal parachute capable of supporting two skydivers. The instructor guides the student through the jump from exit through free fall, piloting the canopy, and landing. The student needs only minimal instruction before making a tandem jump. Compared to most other adventure activities, it’s comparable or cheaper. We are the lowest cost within 200 miles. This is due to our 100% focus students and first time jumpers. This allows us to keep our costs low. When you consider the experience you’ll get and the memory that will last a life-time, skydiving is a real a bargain. Check out our skydiving pricing page for complete information on pricing. Under most circumstances, you’ll land fairly soft. With modern parachutes, landings are most often light and injuries rare. Skydiving is a sport that has inherent risks but those risk are minimized through awareness and through training and certification from the United States Parachute Association. What kind of parachuted do you use? We use tandem parachutes from Strong Enterprises, the world leader in Tandem parachute technology. Read more about our tandem parachutes. We provide goggles that cover eyes and your glasses. Yes. Liability waivers are common in any sport where there is a level of risk. Yes. We have professional videographers who are available to capture your entire skydiving experience. Comfortable clothes and sneakers (no shoes with heels or hooks). In the warmers months, shorts and t-shirts work well. In colder months, pants and long-sleeve shirts are necessary to stay warm. We provide jumpsuits and goggles. Most people are able to make a tandem skydive. We will assist each person in evaluating their physical limitations. We may not be able to take you if your weight exceeds 230 pounds or if you are in poor health. We may be able to make exceptions at our discretion for an additional charge, please call us for more information. We have taken people as old as 90+ years of age. Each skydiver assumes the personal risk of skydiving. 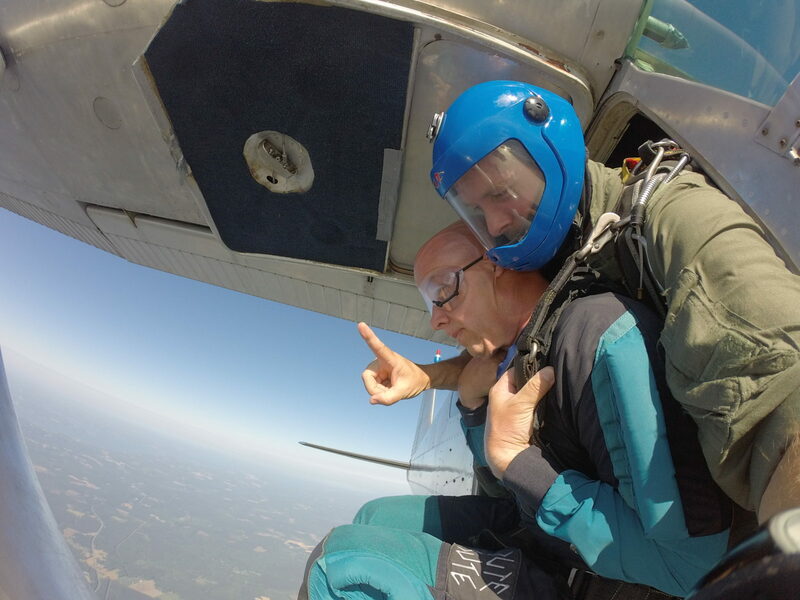 Your first skydive with us has to be a Tandem jump. Having been in the sport for 20 years, I have been involved with thousands and thousands of first time skydives. I can say without a doubt there is no better way to enjoy your skydive knowing that your main job is to keep your eyes open, relax and take it all in. It makes your experience so much more enjoyable and safe being attached to a United States Parachute Association Instructor with thousands of skydives. If you want to become a licensed skydiver, having your first skydive be a tandem jump will greatly help your learning curve. You learn so much more about flying and landing a parachute while hooked to an instructor. They are right there explaining how the system works and to teach you person to person. Tandem Skydiving is the best and safest way for you to experience the thrill of skydiving. Unlikely. If you get motion sickness, tell your instructor before boarding the plane. We can fly the parachute in a smooth glide. For the more adventurous, we can spin in tight turns that enhance the feeling of motion. Our parachute systems contain two parachutes: a main and reserve parachute. The Tandem Instructor is trained on the use of the system and while a parachute malfunction is very rare, it can and does happen. The reserve parachute flies and lands similar to the main parachute. Each of our parachutes containers are equipped with an auto activation device (AAD) that will deploy the parachute if a parachute has not been deployed at a preset altitude. Freefalling is such an amazing sense of freedom. You are able to move your body in every possible position. You can fly forward, backwards, do flips, slow down and even stand straight up while skydiving. Some experienced skydivers can even skydive inverted in a head stand. Most skydives last around a minute and then it’s time to open your parachute. During most Tandem Skydives the parachute is opened at 5,000 feet. This leaves plenty of time to check out the parachute to make sure it is working properly. It also gives you around 5 minutes to look around and enjoy the view. Most skydives are made from around 10,000 ft. to 14,000 ft. providing the skydiver anywhere from 45 seconds to 60 seconds of free fall time. What is skydiving like? Nothing else in the world! The skydive goes by fast and before you know it it will be time to land. The instructor will have you lift your legs for landing so his will touch first. The landing is very gentle. 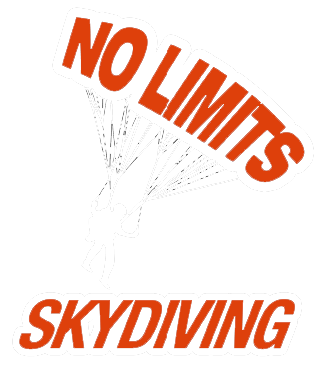 No Limits Skydiving™ has a very impressive safety record and we take thousands of people every year. What is skydiving like? There’s only one way to find out…make a skydive! What is the sensation? Skydiving is truly an experience that is difficult to describe. It has to be experienced to be understood. When stepping out of the airplane you quickly go from zero to 120mph in 10 seconds. Imagine going 120mph for a minute before the parachute is opened. Try this exercise on a safe deserted street. Have one of your friends drive a car and stick your arm out the window while going 60mph…ok now think about doubling the speed and your whole body feeling that sensation. At the same time you get to see the earth getting bigger and bigger coming at you. Feel the small but growing since of concern that it’s getting closer to the time when you’ll need to deploy the parachute. In the back of you mind you might start to wonder, what will happen when we deploy the parachute. It is such a difference between free fall and floating down under parachute. In free fall the wind rushing pass you and is very loud. The free fall portion of the skydive is very intense feeling. Clouds may be going past you at high speeds. The sound of the wind and the rapidly changing visual picture has your senses on full alert. As quick as the skydive started it all comes to a sudden but fairly gentle stop. Once the parachute is open, everything is quite and very tranquil. There are two very distinct types of feelings. Many people who make tandem skydives say the parachute ride is their favorite part. You can really see earth as never before, you have the best seat in the house as you and your instructor float down. You have a 360 view of everything. There really is no better view then looking at earth under a parachute. Skydivers – most people would say anyone jumping from an airplane is crazy. Others would say we never learned not to run with scissors, or to wait an hour after eating to swim. There have always been people in every society that are the type A personalities. The person who stands out, who is willing to take a risk for a great reward. Just imagine how boring life would be, if there were no people who would jump from perfectly good airplanes. Sometimes, these type A personalities are the example to the world of what’s possible. With such a large number of lawyers in the country, people seem more inclined to keep everything on the straight and narrow. If you stick to the well worn out road that everyone else uses, all you will get is one BORING life. Why stay on the same path as everyone else? Just over the hill there are wildflowers to be played in. Except, for skydivers, the wildflowers are in the sky and playtime happens at 120 MPH. There are people from every walk of life who come to No Limits Skydiving™ to make their first tandem skydive. Every year our age group ranges from 18 up to 86 years old. We have almost as many women as we do men who jump. We have doctors and engineers and a lot of college students. We see a large range of emotion. Some people are are excited the whole time and enjoy every thrill. Some people take the learn and study approach. They pay attention to every word and try to learn all they can about skydiving. Other, they are more cautious and fearful. All are good and we tailor to each person’s needs. Once you have made a tandem skydive, you are one of us. A Skydiver. Almost like a super hero. In the days to follow you start to have flashback memories of your jump. As you wait in the check out line buying milk and eggs for the week, you’ll remember you jumped out of a airplane. You recall free falling for over a minute at 120mph, whizzing past clouds just like James Bond. So go ahead and purchase the extra large eggs..you deserve it, you skydived! Of course, skydiving has a greater risk then bowling or playing putt putt. Jumping out of perfectly good airplanes is always going to carry some risk. We free fall at average speeds of 120mph, falling for one minute and floating down for 5 minutes. The goal is a safe, gentle landing under a perfect parachute. To answer the question is tandem skydiving safe, there are a number of factors to consider. No Limits Skydiving™ has a exemplary safety record. We rigorously take steps to make are tandem skydives as safe as possible including paying constant attention to equipment. All our airplanes have a complete inspection every 100 hours. The aircraft are looked at by a certified A&P Mechanic. They complete inspection required by the F.A.A.. This covers all parts of the plane from the engine to the tires. We use Strong Enterprises Tandem Parachutes. Strong Enterprises are the worlds leading manufactures of many types of skydiving equipment, including tandem skydiving systems. Strong Enterprises has many rules and procedures governing how their systems are treated and inspected. We send the entire parachute and container to their headquarters for inspections as required for a complete inspection and maintenance. Tandem parachute containers actually contain two parachutes, a main and a reserve. The reserve is inspected every 6 months by a F.A.A. Certified Rigger. It is also repacked before being back into service. Each one of our tandem Systems is installed with a device called a Automatic Activation Device. These devises are installed in every parachute system at No Limits Skydiving™. The are used to automatically deploy a parachute in the unlikely event it was unable to be deployed manually. The device determines if a skydiver is falling to fast and and getting to the ground. In the case of not having a parachute deployed by a certain altitude, the A.A.D. will automatically deploy the reserve parachute. This is a back up system that ensures a parachute will be deployed under any circumstance. While there is no way to make skydiving 100% safe, No Limits Skydiving™ takes great steps to make sure your skydive is safe as possible.